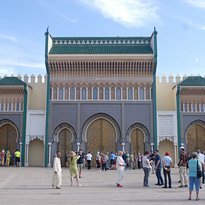 We’ll pick you up from your hotel at 8:30 before leaving Fes to sahara desert starting by explore the high Atlas Mountains, .starting by ifran a Tidy, ordered city, that feels more like Switzerland relocated to the Middle Atlas . Our trip continues to – Azrou -located up a steep hill through a variety of woods to the famed cedar forests inhabited by endangered Barbary Apes. Passing by errachidia, erfoud and rissani stopping for panoramic views along the way of ziz valley. You’ll be welcomed with a local berber thea before you mount your camel, guided by an experienced camel man to explore the mysterious sand-sea of the Erg-Chebbi and enjoy the beauty of the Sahara desert, See it! Feel it! Love it. At your nomad tents you’ll have time to relaxed and enjoy the sunset over golden dunes. 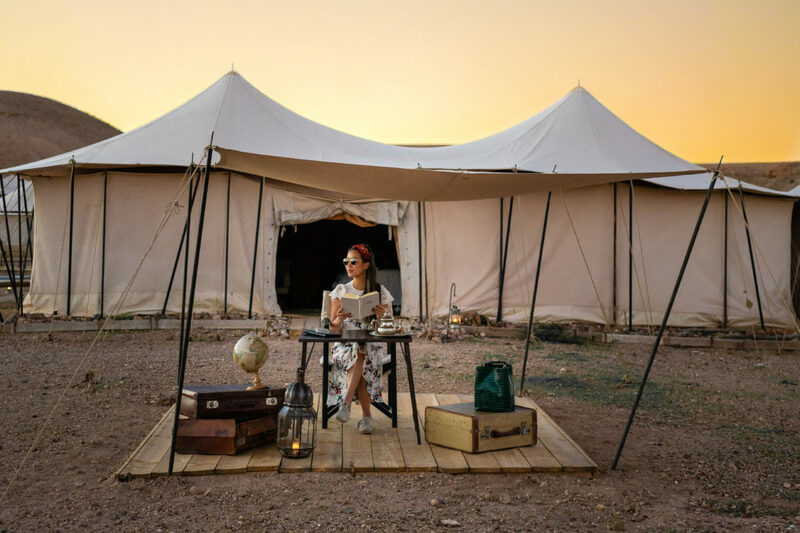 Words can hardly describe the simple, profound and breathtaking magic of watching the sunset over the golden dunes and finally, you will have dinner in front of the camp, where you will spend your first night under canvas – or if you prefer, under the stars. At your request we can bring Berber nomads musicians to play traditional music with drums and dancing around the campfire. For your convenience, our camp is equipped with western bathrooms and showers. After breakfast in the hotel we’ll drive through The Dades Valley, also known as a Road of a thousand Kasbahs stretches 160 km from Ouarzazate to the east of Tinghir. We’ll stop at Kalaa Mgouna, “the rose city” famous with its annual festival of roses. Continuing on to Skoura and the bird’s valley where the main features are the mud brick Kasbahs especially the Kasbah Ameridil, a well-preserved Kasbah in this area. The tour continues to Ouarzazate, “the Hollywood of Africa”, whose geography and beautiful landscapes has attracted many world class movie producers. You’ll get the chance to see Kasbah Taourirt a Hollywood backdrop (Sheltering Sky, Gladiator, and Prince of Persia). Afterwards we’ll dive the UNESCO protected Ait Ben Haddou Kasbah, one of the most beautiful Kasbahs on this area. The Kasbah has magnificent views of the surrounding palms, before heading to Marrakech via the tizi n’tichka pass .we’ll stop to visit the town of Telouet and its ancient 17th century Kasbah then we’ll continue exploring the tIzi n’tichka road especially its great landscape of Berber’s villages TO Marrakech where our exiting tour ends dropping you at your hotel or any other place you choose. More than 130 people are believed to have died in a series of bomb attacks across Sri Lanka. Three hotels – the Shangri-La, Cinnamon Grand and the Kingsbury – were all targeted, with nine foreign tourists reportedly among the dead. Coming early on Easter Sunday, three churches – in Negombo, Batticaloa and capital Colombo’s Kochchikade district – were also hit during services. No group has yet said it was responsible for the attack as investigations continue. A hotel official at the Cinnamon Grand reported to Agence France-Presse that the explosion there had ripped through a restaurant, killing at least one person. Rumours have been reported of more attacks and police have told people to stay inside their houses and remain calm. President Maithripala Sirisena issued a statement calling for people to remain calm and support the authorities in their investigations. Since the end of a long-running civil war in 2009 Sri Lanka has enjoyed a relatively peaceful period. This has seen the local tourism sector boom, with 2.3 million guests arriving last year. The British Foreign & Commonwealth Officer advised nationals in Sri Lanka to follow the advice of local authorities. With state-of-the-art venues across the city, including many on the Palm Jumeirah Dubai is well placed to compete on the global stage to host international events, as it continues to grow its reputation as a world leading leisure and entertainment destination. Helal Saeed Almarri, director general, Dubai Tourism, said: “The sponsorship scheme forms part of our commitment to retain the city’s status as a leading global event destination and has been designed to build on this momentum and act as a catalyst for the local events industry. The sponsorship scheme, which will directly support leisure event organisers, will take effect for events being held from May through an online application process. Dubai’s position as a global events destination has been enhanced with the addition of event venues across the city. Event organisers looking to register and apply for sponsorship, providing they meet the criteria, are invited to visit the official website to begin the application process. Located at the marina, the 146-key property is currently being refurbished and will comprise serviced apartments, holiday homes and residential units in a choice of one-, two- or three-bedroom configurations. It is expected to reopen later this month. Dubai Marina is a popular tourist destination and residential area just off the Dubai Technology and Media Free Zone, which includes Dubai Internet City, Dubai Media City and Dubai Knowledge Village. Damac metro and tram stations, the Marina Mall and the Beach Mall are all within walking distance. Attractions such as Mall of Emirates, Ski Dubai, Ibn Battuta Mall, Emirates Golf Club, Palm Jumeirah, Jumeirah Beach Park and Wild Wadi Water Park can all be reached in ten minutes by car. The Dubai World 2020 Expo site is also only a short drive away. “We are delighted to sign this franchise agreement with Al Masar Hotel Management for Dusit Princess Residences Dubai Marina,” said Lim Boon Kwee, chief operating officer, Dusit International. Dusit Princess Residences Dubai will be the third Dusit-branded property in Dubai, following Dusit Thani Dubai and dusitD2 Kenz. A fourth Dusit-branded property, Dusit Princess Rijas, is slated to open in 2020. Accor has reported consolidated first-quarter revenue of €987 million for the first three months of financial 2019, up 34.2 per cent. On a like-for-like basis, revenue was up 8.8 per cent. Globally, Accor saw RevPAR increase by 1.6 per cent. However, performance was mixed depending on region: Europe was resilient (up 3.3 per cent), while Asia-Pacific was down slightly (falling 0.6 per cent). Accor said it anticipates an improvement in RevPAR momentum across the year, expecting growth of three per cent in 2019. Sébastien Bazin, chairman and chief executive of Accor, said: “In a turbulent macroeconomic environment, the group’s first-quarter revenue performance highlights the effectiveness of our transformation and the soundness of our strategy. “Europe remained strong, while South America continued its robust recovery. “We achieved sustained business development over the period, in line with our medium-term objectives, and continued to strengthen our pipeline, with an ever-increasing share of luxury hotels, which generate higher fees per room. During the first quarter, the company opened 71 hotels, representing 8,300 bedrooms. The pipeline for future openings is 1,135 properties (200,000 bedrooms). Globally, Accor has a portfolio of more than 4,600 hotels.